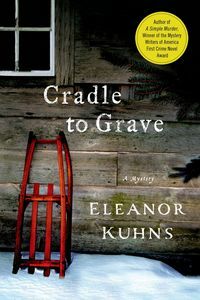 Cradle to Grave by Eleanor Kuhns, a Mysterious Review. Review: Will Rees and his wife Lydia receive a summons at their home in Maine from their friend Hannah "Mouse" Moore, who is now living at the Mount Unity mission near Dover Springs, New York. In a letter to Edler Hitchens of the local mission in Zion, she begs him to find Will and Lydia. "I know they will help me with the charge of kidnapping." Will and Lydia leave their teenaged son in charge of their farm as they make a winter journey across New England to assist Mouse in Cradle to Grave, the third mystery in this series by Eleanor Kuhns. Two weeks of hazardous travel later, Will and Lydia arrive in Dover Springs to learn more about the charges against Mouse. She had come to the aid of a group of children living with their alcoholic mother. At some point she became so frustrated with their condition that she took them back to the mission to be fed and washed. Legally, Mouse kidnapped them and that's what their mother, Maggie Whitney, accused her of. The constable, not knowing what to do with Mouse until the town council can hear the case, restricted her to the mission, forbidding her to leave. After meeting with Mouse, Will and Lydia go to the Whitney farm to see for themselves the conditions the children are living in, and agree that Mouse had a reason to be concerned. But the children seem to love and care for their mother, even though they have little to eat and are ill-clothed for the winter weather. When they leave and return to the mission to say they can do nothing, Mouse is angry. That night, she takes a buggy and leaves on her own. In the morning, when Maggie Whitney is found dead at the bottom of a grave that had been dug months ago before the ground froze, the constable charges Mouse with murder. To prevent Mouse from hanging for the crime, Will must determine who killed Maggie and why. Cradle to Grave starts relatively slowly and doesn't really pick up speed until towards the end. (The murder doesn't occur until about a third of the way in, with two more occurring later.) Much of the early narrative paints the backdrop of life in late 18th century New York, with town polities playing a large role in the lives of families. While all families are welcome to live within a town's borders, they are expected to pay taxes on whatever they own. If it comes to a point when they cannot, and were not born within the town, they are "warned out", unceremoniously driven from their home. Once Will starts investigating, he properly focuses his attention on who might have wanted Maggie dead. It's obvious to him the answer is going to be found by examining Maggie's complicated family structure; each of her children seem to have had a different father, and no one in town claims to know who they might be. But Will isn't satisfied with that answer. When he uncovers the truth, he announces his findings in a courtroom-style denouement in front of the town council. The whodunit storyline is complicated, and rather than try to keep all the characters and relationships straight, it's probably best to simply tag along with Will as he does the ground work. This is an enjoyable mystery, and while the resolution is not unexpected, the small details that lead Will to his conclusion do surprise. And a bit of a spoiler here: The ending also comes as a surprise, but it probably shouldn't: Will and Lydia agree to take the children back to Maine to live with them. It's a touching and fitting conclusion that will certainly make for an interesting household in future entries of this series! Acknowledgment: Minotaur Books provided a copy of Cradle to Grave for this review.